Personal: Graduate of San Jose State University with degree in Mechanical Engineering…Older brother of accomplished collegiate player Michael Tang…Member of 2014 Junior Team USA…Two-time Collegiate All-American with San Jose State (2014-15, 2015-16). 2018: Finished fifth in FloBowling Wolf Open losing to Tommy Jones 227-216 in opening stepladder match...Finished second in Roth-Holman Doubles Championship with brother Michael losing to Jason Belmonte and Bill O'Neill 205-185 in championship match. 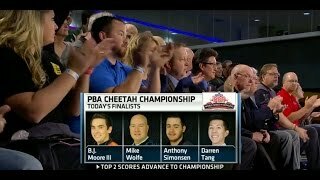 Career: In 2017 finished fourth in USBC Masters losing to brother Michael Tang 248-212 in second stepladder match...Had career high best Tour finish of second in 2016 PBA Cheetah Championship losing to Mike Wolfe in championship match 279-143…Finished 32nd in 2016 U.S. Open…Owns four PBA regional titles.